This year was rich in different IT-events of any kind. InternetDevels company also doesn’t stay aside the movements and trends taking place in Drupal community. We care about Drupal development and about the system itself, that’s why we sponsored and took part in different Drupal events all around the world. Austin DrupalCon on 2-6 June . We visited the Con and have got plenty of wonderful impressions and also met a lot of cool fellow drupallers. During our visit to this DrupalCon, we have travelled around different American cities. We also became a silver sponsor of Amsterdam DrupalCon on 26 September - 03 October. This DrupalCon is memorable for the fact, that the first Drupal 8 release was announced there. In fact, the whole atmosphere of Drupal gathering was amazing as well. Want more details? They are available in our blog post, devoted particularly to this event. BADCamp is one of the most popular camps, annually taking place in Bay Area, LA. This year InternetDevels became a gamma sponsor of the event, supporting in such a way the growth and development of community. DrupalCamp Atlanta took place on October 3-4, 2014 in Kennesaw, GA. It also is an annual meeting, tracing its history back to 2009. The theme of this year’s meeting was “Back to school with Drupal”. InternetDevels supported the event, having become a silver sponsor of it. New England DrupalCamp took place November 1, 2014 in Providence, Rhode Island. Despite the fact, that it lasted just one day, 20 sessions were held there, so that every visitor could choose something particularly interesting for himself. InternetDevels became a silver sponsor of the event. DrupalCamp PA is a two-day event, taking place at Pittsburgh, PA. It is a meetup, created for those, who want to know more about Drupal. Even people with minimal level of technical knowledge would be able to get new useful information there, and, what’s even more important, get general understanding about the CMS and how does it work. We find the idea awesome, so became a bronze sponsor of event. Drupalaton took place on August 7-10 in Kezthely, Hungary. It demonstrated perfect combination of work and leisure with its sessions and trainings along with fruitful communication with fellow drupallers. InternetDevels visited the event and became silver sponsor of it. Read more about it in our blog post. Drupal Camp Fox Valley took place in Aurora, IL and is one of the biggest community meetings in the area. InternetDevels became a silver sponsor of the event. DrupalCamp Montréal taking place in Canada, provides opportunity for Drupal beginners to get more information about CMS and get involved into awesome Drupal community more easily. That’s why InternetDevels became a silver sponsor of the event. DrupalCamp Colorado is a three-day meeting, involving training along with Drupal sessions with wide range of information, appropriate both for experienced Drupal developers and newbies. We have become a bronze sponsor of this event. DrupalCamp LA is an annual free Drupal event, aiming to improve the skills and knowledge of Drupal developers mainly from Los Angeles and Greater Southern California area. The idea of spreading the word free of charge to fellow drupallers appealed to us, so we supported it. Drupaldelphia is an annual DrupalCamp providing detailed information about Drupal to a wide range of audience, both proficient in it and newbies. We became a silver sponsor of it. Pacific NorthWest Drupal Summit is a three-day event with code sprints and sessions, providing information about everything you might want to know about Drupal. InternetDevels became a silver sponsor of the event. We also pay great attention to the development of Drupal Community in Ukraine. Thus, we have became a gold sponsors of this year’s DrupalCamp Kyiv. As you might already know, InternetDevels has included Symfony to area of expertise and is now supporting Symfony events too. In such a way, we became a gold sponsor of the SymfonyCamp Kyiv and visited it as well. More about this event you can read in our blog post. And concerning our own events: we organized annual Lviv Euro DrupalCamp and launched a unique event — DrupalTour. We are aiming at continuous support of Drupal and Symfony events in future. We’ll keep doing this in 2015 so just keep in touch and maybe we’ll meet at one of such events too! We are supporting Symfony Camp UA 2014. On November, 1-2 the best Drupal and Symfony developers will gather at one place in Kyiv. Come and become a part of IT-world! Ready! Drupal! Action! DrupalCon Amsterdam! Thanks for the great time at Lviv Euro DrupalCamp 2014! Our impressions and pictures from Lviv Euro DrupalCamp 2014. Drupalaton 2014 — dive into Drupal 8! 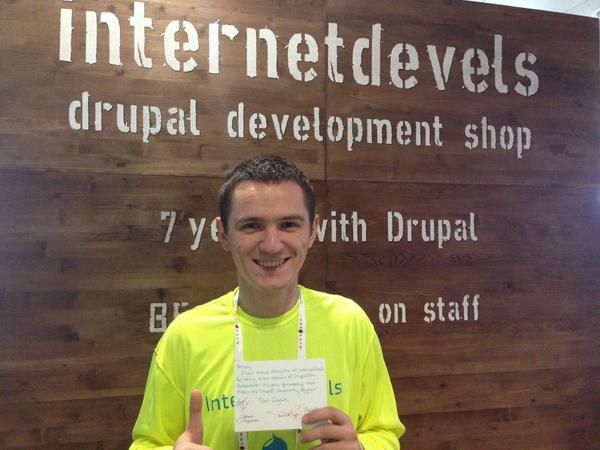 InternetDevels team has become a silver sponsor of Drupalaton 2014. What are our impressions?